While questions of methodology and research design have received a lot of attention, less is known about theory development in comparative social research. As theoretical objectives and orientations are diverse, theorizing takes many forms, ranging from orienting statements and typologies to different kinds of causal propositions. After introducing different understandings of “theory” and associated types of research questions, the article discusses the interplay between empirical research and theory development in comparative social research. Using examples from different fields of application, I argue that theory development in comparative research can be hampered by placing too much emphasis on general micro-level theories, but also by a lack of theoretical abstraction, that intertwines mechanism sketches with historical and contextual details of the particular macro-level phenomena under investigation. The article calls for a greater focus on meso-level theorizing, as it has the greatest potential to produce theoretical knowledge about contextual variation in causal mechanisms and to motivate the development of theoretical models that are explicit enough to be systematically revised across studies. Im Vergleich zu der Aufmerksamkeit, die Methodologie und Forschungsdesign erhalten, wurden allgemeine Fragen der Theorieentwicklung in der international vergleichenden Sozialforschung bislang wenig diskutiert. Aufgrund der vielfältigen theoretischen Zielsetzungen und Orientierungen existieren viele Arten der Theoriebildung, von orientierenden Feststellungen und Typologien bis hin zu kausalen Propositionen. Ausgehend von unterschiedlichen Theorieverständnissen und entsprechenden Arten von Forschungsfragen diskutiert der Beitrag das Wechselspiel von empirischer Forschung und Theorieentwicklung in der international vergleichenden Sozialforschung. 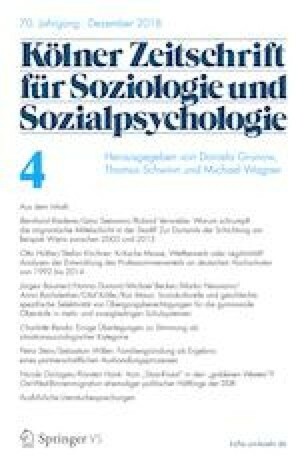 Anhand von Beispielen aus unterschiedlichen Forschungsfeldern argumentiert der Autor, dass Theorieentwicklung in der komparativen Forschung oftmals durch zwei Tendenzen behindert wird: einerseits durch die Überbetonung allgemeiner Mikrotheorien, andererseits durch den Mangel an theoretischer Abstraktion in Arbeiten, die Skizzen von Mechanismen zu eng mit historischen und kontextuellen Details konkreter Makrophänomene fusionieren. In diesem Beitrag wird dafür argumentiert, bei der Theorieentwicklung einen stärkeren Fokus auf die Mesoebene zu richten. Dies birgt das größte Potenzial, theoretisches Wissen über kontextuelle Variation in kausalen Mechanismen zu generieren sowie die Entwicklung theoretischer Modelle anzuregen, die explizit genug sind, um systematisch über verschiedene empirische Studien hinweg verbessert werden zu können. I would like to thank the late Jürgen Friedrichs, Karl-Dieter Opp, the editors, and other attendees at the SOCLIFE conference on “How should we analyze country differences and what have we learned about them? Analytical strategies and explanations based on international comparative surveys” at the University of Cologne, December 2017, for their valuable comments on earlier versions of this work. My interest in the questions discussed in this article grew out of the colloquium series of the Mannheim Centre for European Social Research (MZES), which exposed me to different styles of comparative research. Cieciuch, Jan, Eldad Davidov, Peter Schmidt and René Algesheimer. 2019. How to obtain comparable measures for cross-national comparisons. https://doi.org/10.1007/s11577-019-00598-7. In this volume. Schröder, Martin. 2019. Varieties of capitalism and welfare regime theories: Assumptions, accomplishments, and the need for different methods. https://doi.org/10.1007/s11577-019-00609-7. In this volume.